At-risk students made substantial progress in Core5 in the last few months of school. 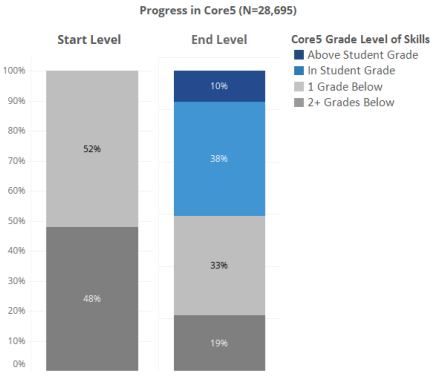 Nearly half (48%) of the students who started Core5 in January 2018 working on below grade level material ended the year working on skills in or above their grade level. After using Core5 for roughly half the school year, the percentage of students working two or more years below their grade level reduced substantially (48% to 19%). Lexia® Core5® Reading (Core5) is a technology-based instructional program that accelerates mastery of reading skills in grades Pre-K through 5. An auto placement feature determines an appropriate start level in the program. Students reach their end-of-year (EOY), grade-level benchmark when they complete Core5 content corresponding to their grade level. Students receive a monthly Performance Predictor score which estimates their percent chance of reaching EOY, grade-level benchmark. Based on their Predictor score and grade, students are given a weekly usage target that is updated monthly. Consistently meeting usage targets increases the chances that students will reach their EOY, grade-level benchmark in Core5. The sample consisted of 28,695 students, grades K through 5, across 177 schools who started using Core5 in January of the 2017-2018 school year. These students were considered at-risk for reading failure because they had started Core5 working below grade level. During the last few months of the school year, students in the sample used Core5 for at least 10 weeks and met their weekly usage targets for 50% or more of their weeks of use. These students averaged 84 minutes per week of Core5 use. At-risk students made substantial progress in Core5 in just a few months. Nearly half (48%) of these students ended the school year working on skills in or above their grade level. The percent of students working two or more grade levels below their grade was reduced from nearly half (48%) to less than one-third (19%).